by Brenda Liddy. Written on 2013-08-02. Published in Reviews from the ISE Chronicle. Chapterhouse Theatre Company’s summer production of Shakespeare’s A Midsummer Night’s Dream took place at Carnfunnock Country Park, County Antrim (Northern Ireland, U.K.) on July 27, 2013. 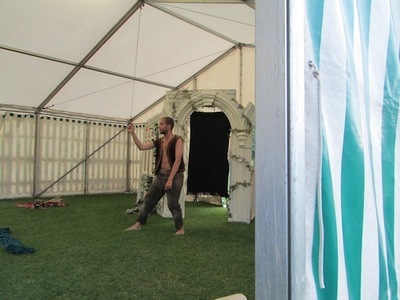 This was an open-air performance, and audience members were allowed to bring a picnic to share with family and friends. There was a marquee on the grounds as well. 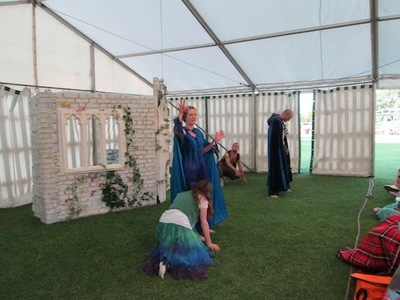 It was a magical experience; and as the audience enjoyed the beautiful weather and the scrumptious food, the talented players trod the boards. As in all in good comedies, there were three key ingredients: exposition, complication and resolution. Instead of agreeing to marry Demetrius, Hermia runs off into the woods with Lysander and is followed by Helena and Demetrius. 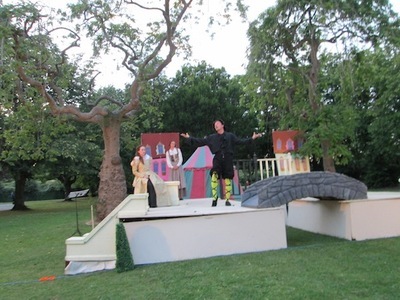 The stage is set for an evening of frolics in forest where the mischievous Puck leads the foolish mortals up and down until the right Jack finds the right Jill, the Changeling child is given to Oberon and Quince’s Rude Mechanicals put on an amazing play. At the end of the play, Demetrius comments to the lion, “Well roared, Lion,” and Theseus commends Thisbe’s running and Hippolyta praises the Moon’s shining abilities. I would like to extol the talent of the seven actors who played twenty-one roles, from the Athenians, to the fairies, to the Rude Mechanicals.